Not often thought of as hotbeds of cutting-edge tech, Robert Ambrogi pens an informative article over at Law.com about innovation generated in law schools of practical use for lawyers and beyond. These applications and services include: the Intellectual Property Litigation Clearinghouse (on-line database with info about IP disputes in the U.S.); The Grace Case Project (offering coverage of the federal criminal prosecution of W.R. Grace & Co. pending in U.S. District Court in MT); The Journal of Legal Analysis (open access journal by Harvard University Press); ABI Bankcruptcy Case Blog (student-penned research on bankruptcy issues); the Intellectual Property Colloquium (series of monthly podcasts produced by UCLA and supported by Loeb & Loeb); Life After Innocence (blog by law students offering resources and legal assistance to recent exonerees); and, The Codicil (journal by Texas Tech students covering estate planning, communit property and related topics). 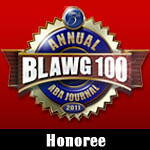 Thanks Bob for this great list and thanks Legal Writing Prof Blog for the tip!